Musculoskeletal disorders can affect the body's muscles, joints, tendons, ligaments and nerves. Dhanwantharam Oil, Sahacharadi Oil, Prabhanjanam Oil, Narayana Oil, Cinnamomum camphora, Winter green Oil, Mentha arvensis, Turpentine Oil, Bee Wax. Jointcare oil relieves inflammation, pain, stiffness, immobility of joints affected by arthritis and spondylitis, musculoskeletal disorders.For external use only. Usage: Gently apply oil on affected area 2 - 3 times a day. Maha Narayan Tail, Gandhpuro Tail, Mahamash Tail, Panchgun tail, Tarpin Tail, Karpoor. Muscular stiffness in musculoskeletal disorders. Low back pain, neck and shoulder pain, sprains, osteoarthritis, sports injury. Apply Rheumo Oil locally over the affected area gently 3 - 4 times a day. Each tablet contains: Boswellia serrata extract (Sallai Guggul ext.) 600 mg.
Osteo-arthritis, myositis, fibrositis, effective herbal treatment for musculoskeletal disorders. Ingredients: Suvarna bhasma, Yograj guggul, Maharasnadi quath (solid extract), Bang bhasma, Nag bhasma, Loh bhasma, Mandur bhasma, Makshik bhasma, Abhrak bhasma, Ras Sindur. Indications: Rheumatism, osteoarthritis, pain in back and neck, muscular stiffness, sciatica, lumbago etc. Dosage: Loading Therapy: 1-2 tablets twice a day for 15 days.Maintenance Therapy: 1 tablet twice daily at weekly intervals. Gandhpuro Oil, Til Oil, Erand Oil, Narayan Oil, Nilgiri Oil, Vishgarbh Oil, Jyotishmati Oil, Nirgundi Oil, Devdaru, Mahamash Oil, Shigru, Karpoor, Mirch and Sarshap Oil. Treats joint and musculo-skeletal pain, shoulder and neck stiffness and low backache. Gently massage the oil over the affected part 2–3 times a day. For external use only. Gel base q.s, Gaultheria fragrantissima, Mentha piperita, Ricinus communis, Eucalyptus globules, Cinnamomum camphora, Cinnamomum zeylanicum, Pinus longifolia, Myristica fragrans. Musculosketal pain, arthritis, spondylitis. Relieves inflammation, pain, stiffness, immobility of joints affected by arthritis, spondylitis and musculoskeletal disorder. Gently apply the gel on the affected area 3 - 4 times a day. 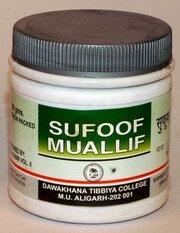 Ingredients: Rasna, Kustha, Katphala, Bhringraj, Shukla jeerak, Jyotishmati, Vatsnabh, Mustak, Deodaru, Kupilu, sarshap, Dhatur beej, Saindhav, Marich, Pippali, Karpoor, Dhatura ke patte, Ashvagandha, Nirgundi beej, Katphal chhal, Rakt Punarnava, Shatavari. Indications: Effective in arthritis, cervical spondylitis, lumbago, rheumatic diseases. For external use only. Mode of Application: Massage this taila on the affected part atleast twice a day. Mahanarayan Oil, Nirgundi Oil, Erand Oil, Nilgiri Oil, Kumari Pudina, Karpoor and Sarjras. Musculo-skeletal conditions of joints, muscles, tendons. Sports injuries, helps to reduce swelling and inflammation. Gently massage the cream over the affected area 4–5 times a day. For external use only. Gandhpuro Oil, Devdaru Oil, Peppermint, Narayan Oil, Mahamash Oil, Vishgarbh Oil and Capsicum annuum (Mirch) Oil. Gently massage the ointment over the affected area 2–3 times a day. For external use only.